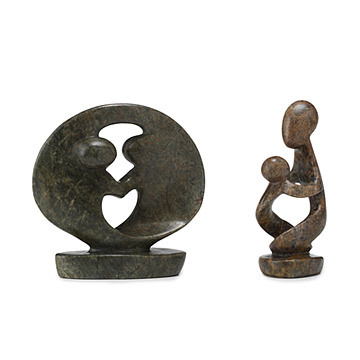 Hand-carved by Shona artisans, these soapstone sculptures personify ukama, or the bonds of family. Beautifully hand crafted by Shona artisans of Zimbabwe, these serpentine stone sculptures are known as "Ukama" or "Loving Family." Carved from one solid piece of stone, these stunning and sturdy examples of African art symbolize unity and the shared spirit of the family. Click to view possible color variations of this handmade item variation 1, variation 2, variation 3, variation 4. The Shona tribe of Zimbabwe, literally translated as "the house of stone," are considered by many to be among the world's finest sculptors. Modern Shona artisans select and quarry their own stones, just as their ancestors did thousands of years ago. Statues are hand-carved using simple chisels, polished with sand and beeswax, and heated on a fire to bring out their brilliant colors. Shona Sculpture is arguably the most significant art form to emerge from Southern Africa this century. The contemporary designs and emphasis on family and relationships enable these sculptures to be incorporated into almost any living environment. Dancing Couple: 6" H x 6" dia., Mother and Child: 6" - 7" H x 2.5" dia. The stone sculpture will be beautiful to display in my family's home and is a wonderful gift to give to represent the importance of family. Very aesthetically pleasing to the eye, it's a timeless piece that will evoke personal memories every time I look at it. It's a great value for its price. One small downside is that it has a narrow base, so it's easy to accidentally knock over. Great wedding gift that is unique and has a nice story about where it came from. We had it shipped to California directly to the couple. When we arrived at their house it was displayed on their mantle. Only disappointment is that there was a cheap sticker on the back that said "made in Zimbabwe". I bought this for my wife for mothers day from our 18 month old. She absolutely loves it! Very beautiful handade piece. Just the right size for a bookshelf or mantel display. Worth every penny for a hand made piece. This little sclupture was super cute and my mom loved it. It was slightly smaller then the picture showed it to be but we loved it just the same. Perfect gift for middle aged newlyweds that have everything! Bride and groom have both been married before so buying the usual wedding type gift or writing a check or give a gift card didn't seem appropriate. This artist's theme of love and the bonding of two hearts, minds and spirits is a perfect representation of the new lives they will celebrate on their wedding day and forever.